Hi Maryanne what a busy desk today. Love the swirly canvas design. O.k. maybe I will be brave one day and try to knit socks – but I can’t imagine they are boring!!! haaa And what mess?!? I like the looks of the canvas so far. I’ll put a star by your name so I can come back and take a peak. 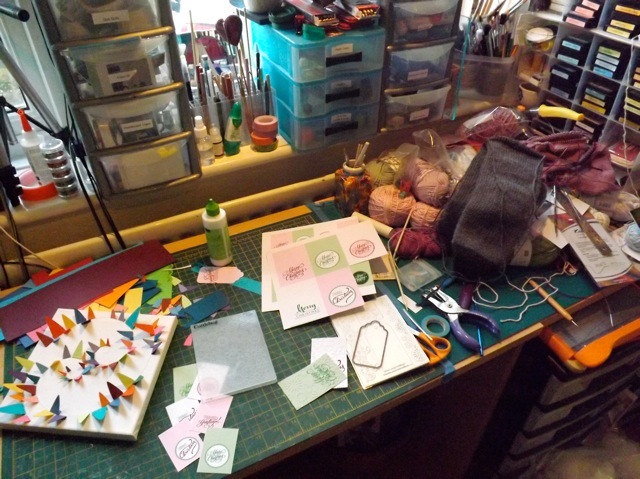 I also have separate areas for yarns and textiles, and mostly-paper. Love the socks. A real labour of love for the big footed recipient! I think I’d love sitting at your desk for a morning. So many fun things to choose from. Thanks for sharing. Thanks for dropping by Betsy this week, for a visit, and for the wonderful comment. I admire all the bloggers that knit, and such wonderful gifts you all make! I really like busy desks! What are these little buntings for? Or is it something else. Looks interesting to me! Well, as you’ve been doing Knitted Knockers recently, it would be kinda fun to do Crochet Balls…….snigger. 🙂 see if you can find a pattern for THEM on Pinterest!!! What a lovely mess! I love it! Those tags are really great. I might grab them for next year. Thanks. It must be a great feeling to be on target…. if things do go wrong it won’t be your fault. Have a great week and don’t work too hard. I’m loving the desk of two halves – it really is! I’m in a flux of unfinisheds now, and that applies all around I think…it’s kinda like all the balls have to come down from the air, huh! Love the look of the canvas, and have really admired the printables and your wrapping…..my wrapping area is WORSE than the state of my desk, so am not showing that!! Hi there Maryanne peeked down below your gift tags are beautifully done well done.. and I dips me lid to anyone who knits socks big feet or no!! hope all deliveries go to plan 😀 think you’re not the only one hoping that.